Wild populations of the iconic Mekong giant catfish will be driven to extinction if hydropower dams planned for the Mekong River go ahead, says a new report by WWF. The report, River of Giants: Giant Fish of the Mekong, profiles four giant fish living in the Mekong that rank within the top 10 largest freshwater fish on the planet (see list of top 10 at bottom of page). At half the length of a bus and weighing up to 600kgs, the Mekong River’s giant freshwater stingray (Dasyatis laosensis) is the world’s largest freshwater fish. 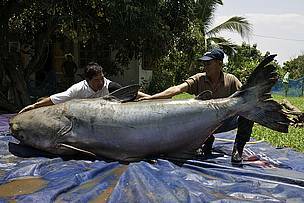 The critically endangered and culturally fabled Mekong giant catfish (Pangasianodon gigas) ranks third at up to 3 metres in length and 350kgs. Current scientific information suggests the Mekong giant catfish migrate from the Tonle Sap Lake in Cambodia up the Mekong River to spawn in northern Thailand and Laos. Any dam built on the lower Mekong River mainstream will block this migration route. 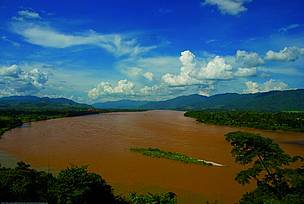 The hydropower dam planned on the Mekong River at Sayabouly Province, northern Laos, is a threat to the survival of the wild population of Mekong giant catfish. The Sayabouly Dam is the first lower Mekong River mainstream dam to enter a critical stage of assessment before member countries of the Mekong River Commission advise on whether to approve its construction. The other Mekong giant fish featured in the report are the "dog-eating" catfish (Pangasius sanitwongsei), named because it has been caught using dog meat as bait, and the giant barb (Catlocarpio siamensis), the national fish of Cambodia and largest carp in the world. At 300kgs each, these fish tie for fifth place on the global top ten. However, the impacts of lower Mekong River mainstream dams are not restricted to these Mekong giants, they would also exacerbate the impacts of climate change on the Mekong River Delta, one of the world’s most productive regions for fisheries and agriculture. 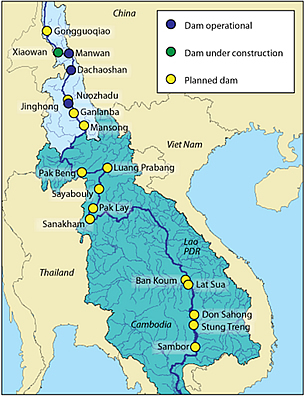 Building the Sayabouly Dam would reduce sediment flowing downstream to the Mekong River Delta, increasing the vulnerability of this area to the impacts of climate change like sea level rise. WWF supports a delay in the approval of the mainstream dams, including the Sayabouly Dam, to ensure a comprehensive understanding of all the positive and negative impacts of their construction and operation. To meet immediate energy demands, WWF promotes sustainable hydropower projects on tributaries of the Mekong River, prioritising those that already have hydropower dams developed on them. 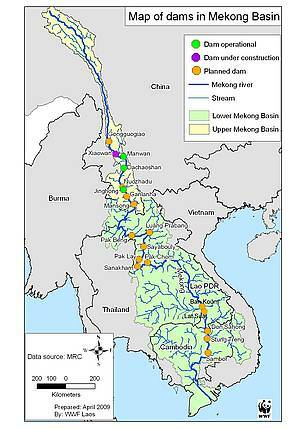 Map of the Mekong dams.